Postcard GB-498496 shows Piccadilly Circus, a public space of the famous West End in the City of Westminster near London. It was built in 1819 to connect Regent Street with the major shopping area of Piccadilly by a "circus", which means "circle" in Latin, i.e. a round open space at a street junction. Since the Circus is close to major shopping and entertainment areas in the West End. It is noted as a public meeting place and a major tourist attraction. According to Wikipedia, "the Circus is particularly known for its video display and neon signs mounted on the corner building on the northern side, as well as the Shaftesbury memorial fountain and statue of Eros. It is surrounded by several noted buildings, including the London Pavilion and Criterion Theatre." As someone living in the self-centric America, I can't resist the idea of labeling it as London's equivalence to Time Square in New York City. 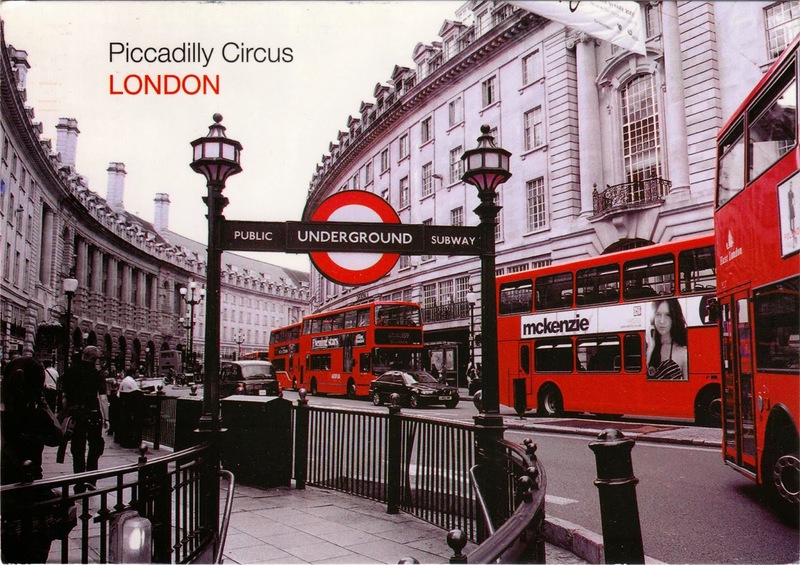 Directly beneath the Piccadilly Circus lies the London Underground System.